Yesterday we got a first peek into the NewMediaAge annual ranking of digital specialists in the UK. It shows the whole sector of digital agencies in recovery, indicated by growing budgets and new revenue streams. Agencies look to diversify into mobile, social media and display. The ranking called Marketing services guide shows a list of Digital agencies split by sector. The full report isn’t available online yet. But the top three’s where given. The combined revenue of the top six of the list rose with 14,6% to £27.07m from last year’s figure of £23.62m. 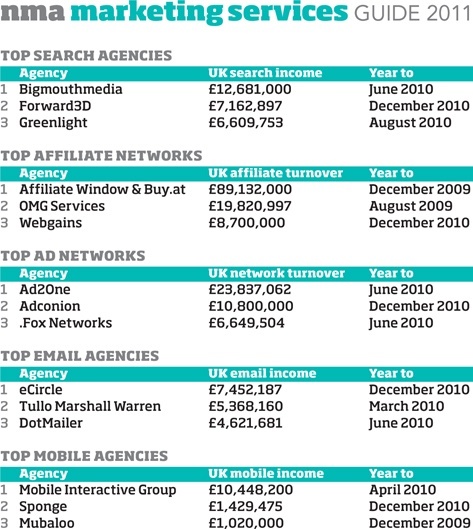 ECircle had the highest income from email marketing with £7.45m for the year to December 2010. Tullo Marschall Warren and DotMailer also in the top three. “Meanwhile, email providers are realising that their medium lends itself to well-honed integration with social media. * BThe annual report it shows trends for both industry and individual participating companies. * It is a chance for digital agencies to profile themselves based on results (we mean cash). versus the ones that focus only on technology.